This recipe is for the old-fashioned baked macaroni and cheese, made with cheddar cheese, milk, egg, and a touch of cayenne pepper. This tasty casserole can be served as a main dish or side dish. It can also become the base for numerous variations. Boil macaroni in salted water, following package directions. Drain under running cold water. 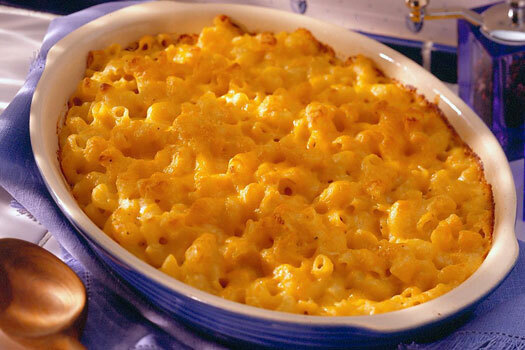 Cover bottom of a 2-quart baking dish with layer of macaroni, a layer of cheese, bits of butter, salt and pepper. Continue layers until all ingredients are used, ending with a cheese layer. Whisk milk and egg together, pour over the top, cover with buttered bread crumbs, and bake in a 350° oven for 25 to 35 minutes, until browned and cooked through. Process 2 slices of bread in the food processor; toss with 2 to 3 teaspoons of butter.